Yay! Finally it rains quite heavy this morning , oh well there was a little bit of short rain here and there since last Sunday but unlike this morning. For the past week, omg the weather was so hot. I shower more than three times a day, my office has shower room so during lunch time or tea time I really can’t take it the weather is so hot so I took a quick shower. After shower I feel ahhh... awesome, pampered and refresh because I am using Dove Body Wash with NutriumMoisture. Now nourishing my skin has never been so easy. If you would like to know more about Dove School of Skindulgence on how to eat right, stay active and pamper better than milk continue to read. Last week, I attended Dove Body Wash with NutriumMoisture launched the Dove Skindulgence campaign as a solution to encourage women to indulge and pamper themselves on a daily basis in less time and with less money…and all in the comfort of their own home. There were so much fun during the event I learn how to make Broccoli Chicken Salad and Soba Salad. These are some examples of how to prepare quick, simple and delicious healthy food. If you are a follower of my Instagram @Kelly2988 you will notice that everday I post something about #skindulgence either doing my exercise or workout at home #stayactive or eating balance and healthy food #eatright or I am pampering myself #betterthanmilk. Yes! I have pledged to take good care of myself and take up the 21 days challenge from 1st till 21st March 2014. 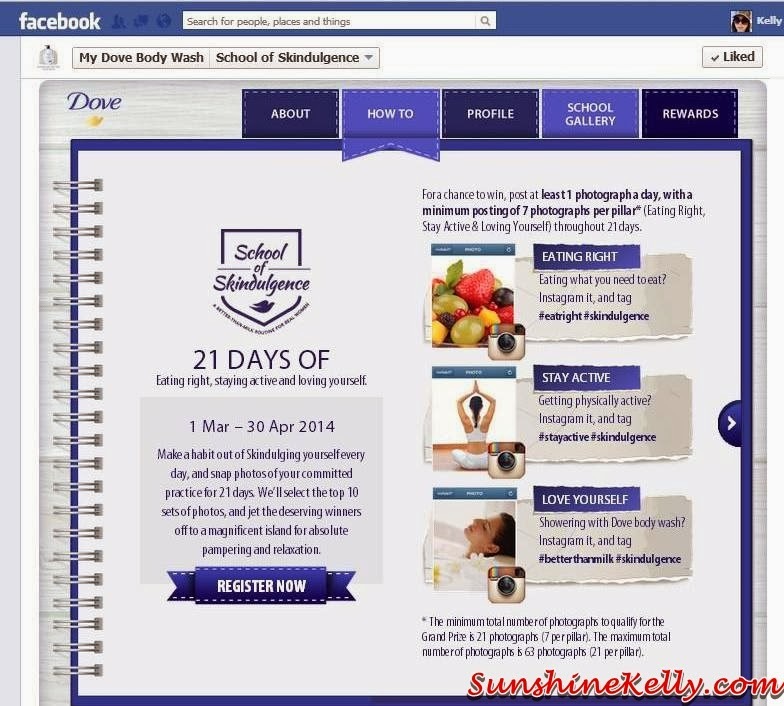 You too can join Dove School of Skindulgence just logon to My Dove Body Wash Facebook Page facebook.com/mydovebodywash to find out more. After taking the pledge on the Facebook app, you can choose the date to start your 21 days challenge to achieve the three main pillars of Skindulgence – pamper yourself, eat right, and stay active. All you need to do is share at least one photograph daily via Instagram hash-tags, (#skindulgence #betterthanmilk #eatright #stayactive) with a minimum total of 21 photographs (7 photographs per pillar) in the 21 days of how you take care of yourself at home. Do you know that skin is our largest organ and often we neglect to take good care of it because of time and money are the biggest hurdles in pampering ourselves on a regular basis. I think all of us including myself would love more time to indulge in pampering our skin and engaging in healthy activities to nurture their overall beauty and wellness. Well, Dove Body Wash with NutriumMoisture is proven to be better than milk. The unique blend of moisturising and nourishing ingredients replenishes nutrients back into the skin while you shower. You are left with nourished and moisturised skin, just as if you went for a spa treatment. That in itself is daily pampering for your skin right… so everyday I am pampering myself, love it. Dove Body Wash with NutriumMoisture is available in all variants - Beauty Nourishing, Gentle Exfoliating, Sensitive Skin, Fresh Touch, Energize and Revive in 1 litre bottles at RM22.90. It is also available in 200ml at RM5.90 for the Beauty Nourishing and Gentle Exfoliating variant. The body washes are available at all leading pharmacies, hypermarkets and supermarkets.